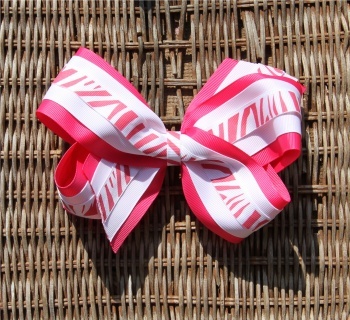 Triple Layers of Pink and White Zebra Print, now that's a bow! This has a shocking pink bottom layer then a white grosgrain topped off with a pink and white zebra print. All wrapped together by the pink zebra print and attached to a French clip. Every girl will have to have this fun pink zebra bow! You are getting 120 inches of ribbon on this big bow, WOW!